What do you enjoy about collaborating with brands? I love having the opportunity to draw upon full creative freedom to create imagery and content that speaks to a wide range of audiences. It’s a really amazing process to work closely together with a brand to create magic for everyone involved. What’s influencing your photography at the moment? A lot of my photography at the moment is inspired by the subject matters and talent that I’m shooting. Every creative needs a muse. So much of the talent that we’ve been shooting have been so beautiful but they also have really interesting backgrounds and stories. I love tapping into the personal side and seeing the unique moments we can achieve in the photography. Tell me about shooting in Paris for LXÉ. What was the experience like? We had so much fun on this shoot, shooting on the streets of Paris is always interesting. Even though there were some stressful moments i.e. freezing temperatures, moments of snow, crazy Parisian traffic and crowds of tourists sidelining our every move, the Parisian streetscapes always make for the most beautiful images. Working with the LXÉ team was a dream come true, Olivia [Sheed, the brand’s creative director] was very trusting in our vision and everyone was so excited when we presented the campaign. What would be your dream photo shoot location? The black sand beaches of Iceland. What’s the key to taking a good photo? Feeling inspired is the most important part of the process, creativity needs to come from a higher place and even those who are very creative can find that not being in the right mindset means that personal emotions can through in in the imagery. For me I love beautiful, natural light and the images I’ve taken in direct sunlight are always my favourites. Who would you love to photograph in future? I would love to travel to destinations where the location and the culture are visually inspiring, shooting people in places such as Cambodia, India or Peru. The challenge is to capture individual personalities through the lens, which is a special skill. What’s a day in the life of for you? To be honest, there really is no average day. Each day is completely different to the other and always busy with creating concepts, editing, writing, photography etc. At the moment we are working on some large scale projects so it’s always a balancing act between production for existing work and working on creatives for the next exciting collaboration. You seem to travel a lot! What do you love doing when you’re at home for a few days? I’m very lucky that I get to travel so much with my business, but it’s always nice to be home. For me, weekends are scared and I really value time with my friends and family, if I do get some down time the first thing I always do it pick up my paintbrush as I love to paint. I’ll get in trouble if I don’t say Sam & Knoxy [Shadforth’s husband and son, respectively] but that’s just a given, they are always on my mind. Next on the list is the coffee from my local cafe. Also I have a bed that I call the fluffy cloud and am yet to find one that compares. What are some of your daily rituals? I’m quite a creature of habit so there are too many embarrassing rituals to mention, however the first one that comes to mind is visiting my favourite cafe for a caffeine fix. What’s currently on your shopping list? Vetements Ankle Boots, a Loewe Sweater for the cooler months and I’m obsessed with cropped flares at the moment, they are a must have on any shopping list. 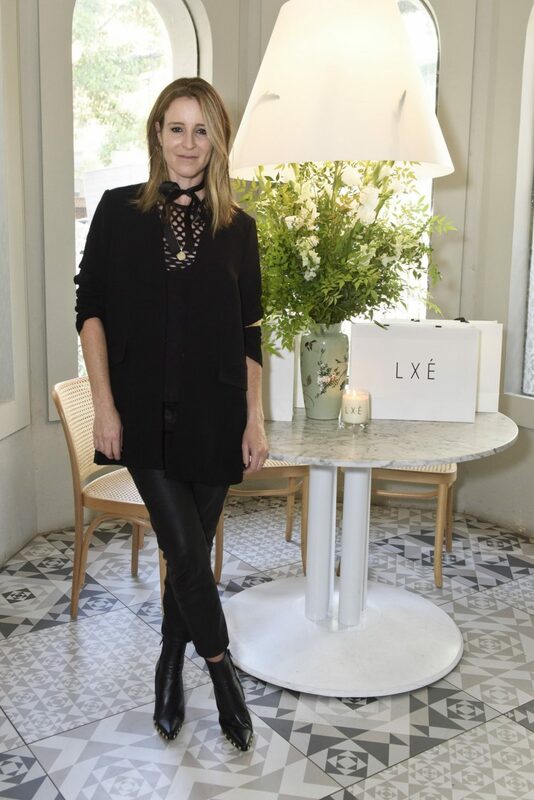 No winter wardrobe is complete without the perfect pair of leather pants… Lucky for me, LXÉ was there to help a sister out in the leather pants department. Whose wardrobe would you love to have unlimited access to? Jane Birkin’s wardrobe, please… So effortless and chic. What’s next for the Oracle Fox brand? There is no denying that Oracle Fox has taken me on some amazing adventures, and allowed me to realise many of my goals, some which were previously just a dream. My ultimate career goal is to continue to grow the Oracle Fox brand and to share beautiful original content with my readers. To be honest my greatest competitor is myself, so I am always working on pushing through my own boundaries and limitations, this is a really satisfying process and serves as an ongoing challenge. Being an artist by trade, I have high expectations and am extremely critical of my own work. The main focus is always working to continue the growth of Oracle Fox, the Oracle Fox Journal and continuing to love what I do. Beautiful pictures are Amanda Shadforth’s forte. Her blog Oracle Fox is a constant stream of visual inspiration. Amanda admits that she initially started her blog as “a giant mood board”, however fast forward a few years later and Amanda’s “mood board” has now turned into a very successful career. I had the pleasure of working with Mandy on Fashion Bloggers and I can attest she’s a woman with impeccable taste. Here Mandy talks about her shopping weaknesses, dining at Louis Vuitton’s house on her birthday and why she keeps trying to steal my Balmain jacket! My first blog post was a picture of the sun setting over some cane fields near my house, I titled the post ‘From little things, big things grow’ and looking back now, it seems very apt. I’m sure I was thinking “no one is going to see this” but that’s the beauty of this industry, you never know what’s just around the corner. Being able to connect with my readers that are all over the world has been so fun and a completely unexpected part of the job. I’ve also had the opportunity to work with some of the most interesting and influential people in the industry which can be very surreal but so inspiring. Oh and let’s not forget having the opportunity to meet and work with your lovely self too!! I spend a lot of time in front of the camera for Oracle Fox, however filming is a very new experience for me. I would be lying if I didn’t say I was a little apprehensive and nervous leading up to the show. The crew and producers are very professional though, and we had a really great time in the process. It was great spending time with the other girls and having the cameras there to film some of the big projects that are in the works for Oracle Fox. At the end of the day though, being a photographer I much prefer life behind the lens. It’s no secret that I love black, I’m a serial offender! My go-to outfit this year has been a pair of Isabel Marant leather pants with motorcycle zippers, a good quality basic shirt and a Balmain jacket. I’m obsessed with Balmain jackets. As you already know I keep trying to steal yours when you’re not looking! (laughs). Oh my god every girl’s nightmare is post-outfit regret. When I was pregnant I actually made some very obscure fashion decisions. Let’s just say that this is part of the reason why I stay safe with so much monochrome these days! In my opinion, Jane Birkin is the ultimate iconic. Natural skin, doe eyes and simplicity never go out of style. Every time I travel to Paris for Fashion Week something spectacular happens. It’s honestly one of the most magical cities in the world. This last Spring/Summer Paris Fashion Week I was actually invited to the home of Louis Vuitton in the outskirts of Paris. It was such a privilege and honour to dine with the team at this very special residence and to top it all off it was also my birthday the same day. It would be an equal tie between Givenchy, Cèline and Ellery. Each of these designers are some of my favourites and all bring something unique to the party. I’m a tomboy at heart and I love the hard edge cool factor of Givenchy, I also find that Cèline do such beautiful subtle pieces each season and the silhouettes are just divine. I wear a lot of Australian designer pieces and Kym [Ellery]’s work is just a little bit feminine with an element of structure. Hands down Colette in Paris. I know that it might sound predictable but seriously it’s not just about the beautifully curated selection of designer pieces from all around the world but I always stock up on beautiful photography books, magazines and those cool little tech gadgets that they sell at the counter. My Céline heels that I just couldn’t leave Paris without purchasing during last season’s Fashion Week. Definitely an extravagance but also an investment. You know I was only getting ready to go somewhere this week and I thought I really need a handbag that’s not black! I’ve been thinking for a while that I wouldn’t mind a new bag in a dove grey or perhaps a khaki or navy. Hands down Camilla Akrans is one of my favourite photographers. There is an editorial that she shot for Vogue Japan in March 2010 featuring Anja Rubik wearing all of these beautiful white semi transparent pieces. It’s just so divine, so simple and beautiful and oh, Anja is holding a baby lamb, say no more! Styling photos for my Instagram is one of my favourite parts of the work day. Great lighting is always key and I couldn’t do without a perfect white backdrop. Lastly I always use the Afterlight app, it’s excellent for sharpening images and adding a subtle filter. Me with fellow bloggers, Sara Donaldson, Margaret Zhang, Zanita Whittington and Amanda Shadforth.